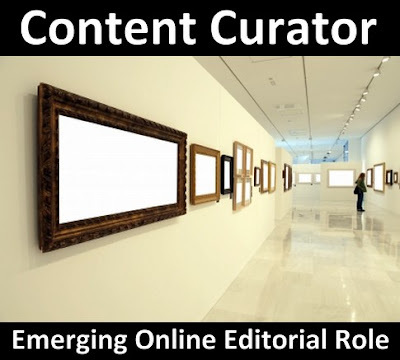 The content curator can be understood from the next emerging role for the content restoration and distribution. They would be professionals of valuable service to the people who may be searching for quality information online-a personalized, qualified selection of the best and most relevant content and resources on a very specific topic or theme. In other words, a content curator is someone "who continually finds, groups, organizes and shares the best and most relevant content on a specific issue online". The most important component of this job is the word "continually." As it is the need of the time for rubbing away rubbish content scattered all over the bandwidth. This is expected to be the emerging online editorial roles of the future. They would be professional working at the middle layer of the editors involved in the task like gathering, filtering and distributing relevant and necessary information. Mastering how to create niche-targeted compilations of content is indeed one of the key lifesaving strategies that wise-minded online publishers can adopt to offer greater value, even at a price, to those interested in it.